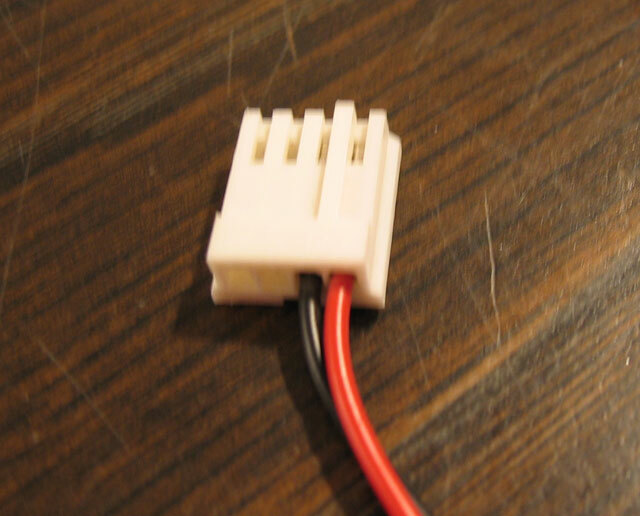 If you would like to add a power connector to your MyIDE+Flash these instructions may help. 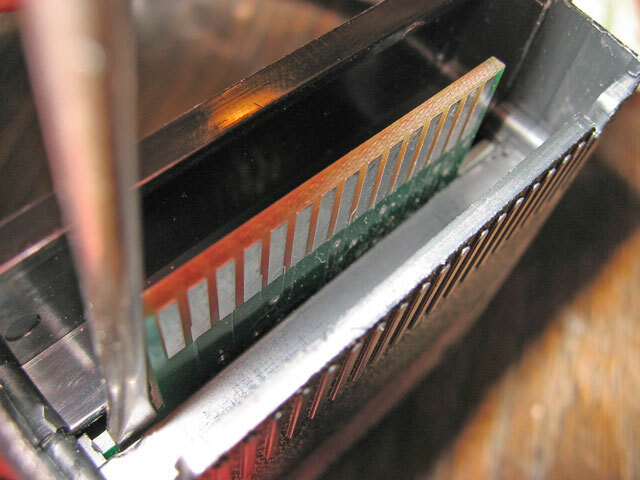 Please do not try to power a hard disk from your cartridge port, you will probably damage the cartridge, computer or power supply. Using a CF adapter with a CF card or micro-drive will work fine. A molex power connector cut off an old PC power supply is ideal. If there is a yellow/black pair, remove those wires. The cartridge may be difficult to open the first time as the shells are tightly press fit together. To start, grab the cartridge at the open end and try to seperate the two halves. If you cannot open it manually, you can very carefully insert a small flat head screwdriver between the PCB and top shell as shown below. Be careful to insert it only between the top shell and PCB to avoid damaging components which are on the other side of the PCB. Insert it at the position shown just until you reach the securing peg, then gently pry to release the peg from its holder. Repeat on the other side of the cartridge. The photo below shows the screwdriver inserted just up to the securing peg, do not insert beyond this point or traces and components could be damaged. 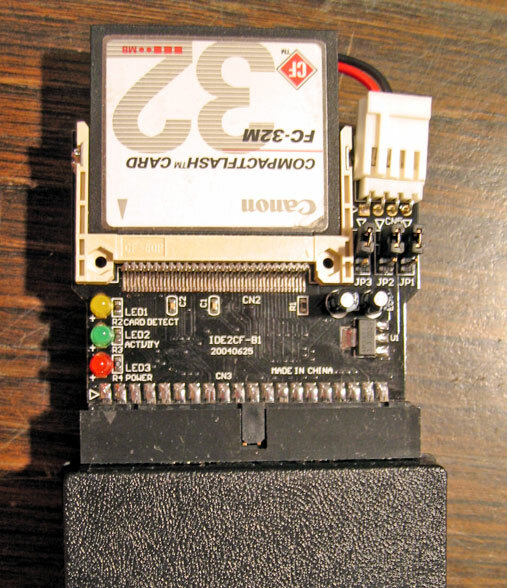 Once you have the cartridge open, locate the position labelled 'C2' on the upper left of the PCB. Solder your red wire to the hole marked (+) and your black wire to the other hole in the same circle. Tuck the wires around the side of the pcb so they can leave through the open space behind the IDE connector. This is a tight area, so it will also act as a strain relief for your power wires. Reassemble the cartridge shell. You now have a standard 5v+ connector you can use to power small devices like a CF->IDE adapter. Last edited by classics on Tue Feb 07, 2006 2:13 am, edited 1 time in total. With that particular CF/IDE adaptor you show, you can power everything through pin 20 of the IDE connector. Just connect your +5v to pin 20 of the IDE connector inside the case, and plug in the adapter. Set JP1 on the adapter to 2-3 and it works without any power connector at all. Since pin 20 is normally not connected for IDE, I have not had any problem using real hard disks with the cartridge wired this way either. Of course then the drive must have an external power source. I noticed that, its a very nice feature. I dont think many CF adapters have it though. 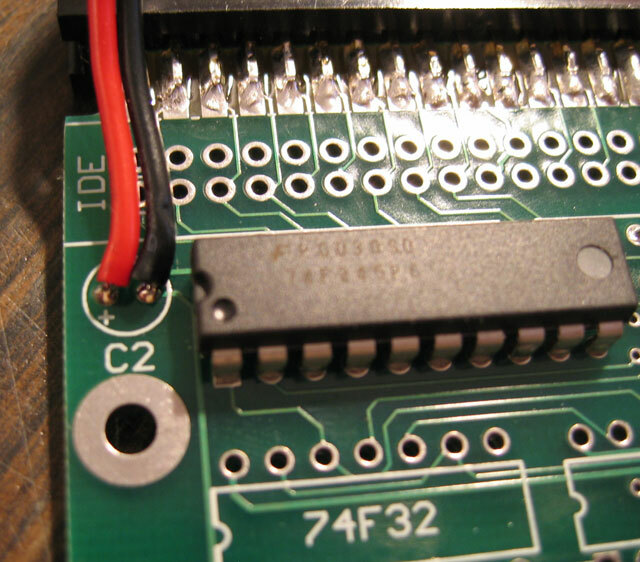 Here are some photos of how to add power on pin 20 of the IDE connector. I have tested this with the CF adapter shown above and it works great! 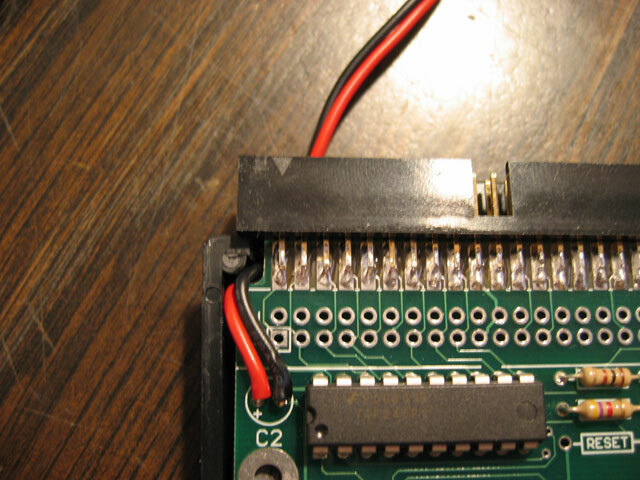 Be aware though that if you do this modification it becomes possible to create a short across the 5v+ power supply line by plugging in a defective IDE cable, or a very old IDE drive that incorrectly ties pin 20 to ground internally. 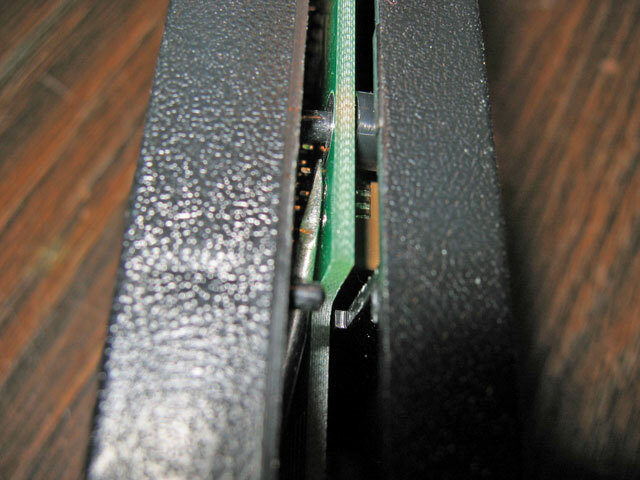 First step is to open your cartridge as shown above. 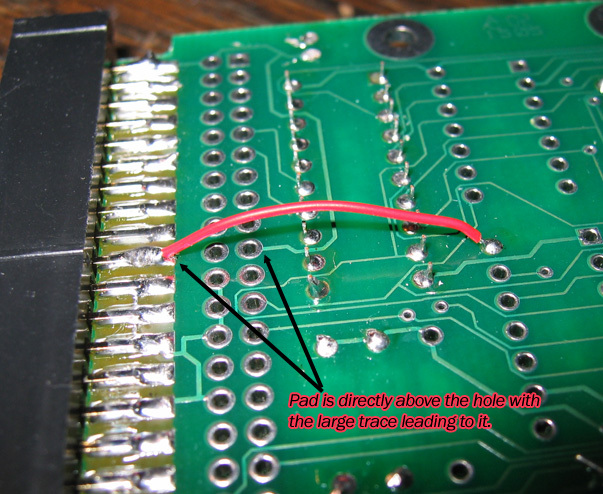 Then turn the PCB over to the solder side and locate pin 20 of the edge connector. This pin is easy to find, it is directly above the hole with the large trace leading to it in the photograph. 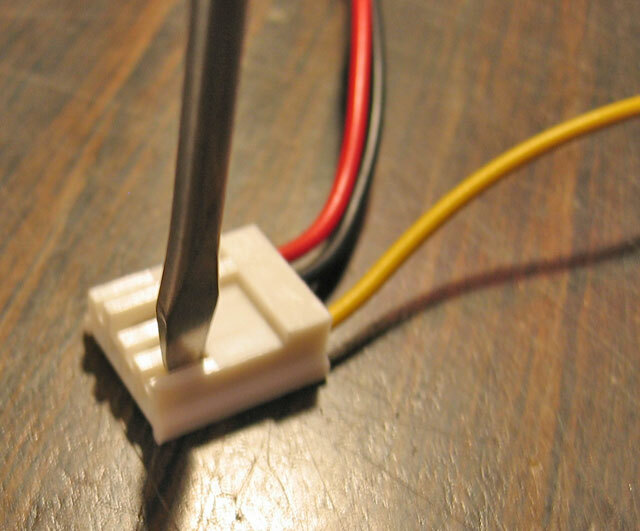 Take a small length of wire, about one or two inches and solder one side to the pin shown in the photo, and the other side to pin 14 of the empty IC position shown. Absolutely excellent instructors! Made it a piece of cake! It just so happens that I have that same CF2IDE adapter and I have a question concerning its use with the MyIDE cartridge. I have never seen the activity light on the interface or the cartridge work with a CF card. If I connect an external powered 2.5 IDE drive to the cartridge, the activity led in the cartridge works fine. So is this a matter of having 2 activity leds, one in the cart and one on the cf2IDE adapter, are cancelling each other out. The power and CF card detect leds are working correctly on the cf2IDE interface. It is just the activity leds that are not working in this combination. Also, the later MyIDE cartridge must already have pin 20 connected to 5 volt power in the cartridge as when I set the jumper on the cf2IDE interface for internal power, it works fine. And most 2.5 hard drives do not have a pin 20 so with them, an external power source is needed and I just as soon would not want to have a connector hanging out of the cartridge. Have the photos from this thread been archived somewhere? This is still useful info and without the pic(s), it is not very clear. Personally, I would pin this one. Probably the only one that is really necessary is the one chowing the jumper wire connecting pin 20 to wherever it goes. Last edited by thewhiz on Sat Sep 06, 2014 3:01 pm, edited 1 time in total. I updated the links to the images. What is the current limit before damage to the Atari or the MyIDE+Flash External? Rambo'ed or upgraded XL/XE? I personally used a very tiny fuse in line on the wire jumper... you never know what can happen these days and at a few pennies it can't hurt to prevent damage when something goes wrong! very simple and effective. when I say tiny I mean tiny sized and tiny current rating... I am using a transcend solid state IDE module with not much draw. We are fixing stuff and listening to song!